Remove filet mignon from refrigerator ten minutes prior to grilling. Generously season with salt and pepper on both sides. Place red onions slices and limes on grill. Grill limes for about 4-5 minutes, flesh side down. Grill onions for 4-5 minutes per side. Remove from grill and let sit. Place filet mignon on grill. Grill each side for 3-4 minutes for medium rare or 4-6 minutes for medium/medium well. Place corn tortillas on grill and grill for 1 minute per side. Remove from grill. 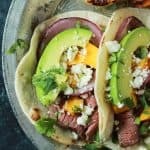 Assemble tacos: corn tortilla, steak, diced mango, a couple slices of red onion, 1 teaspoon of queso fresco, 1-2 slices of avocado. Squeeze grilled lime over tacos and serve!